It all started with a gingerbread house when "Chef Paul," Bloomfield Public Schools culinary arts instructor, and his students competed in Hartford Area Habitat for Humanity's Gingerbread Build fundraiser a few years ago. 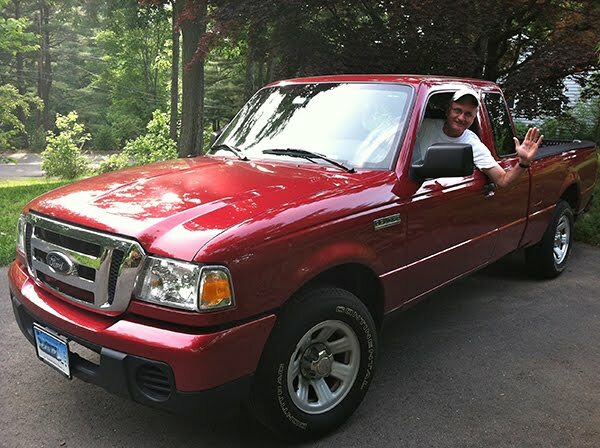 It was then that he heard Habitat would be building several affordable homes in Bloomfield. An idea began to percolate. Building a holiday gingerbread house is fun, even tasty. But what if the students could actually fund and build a real house, an affordable Habitat home. If so, the students truly would be living up to the school system's motto "Raising the Bar is Taking us Far" -- its mission for maximizing student achievement. Combining enthusiastic school district support, Habitat's know-how, and student-led creative fundraising, Chef Paul's idea has been formulated into a winning recipe for building a safe, decent and affordable house in Bloomfield rightly named "The House that Students Built." This Energy Star-rated single-family home will be built with 85% volunteer labor. Bloomfield Public Schools' first-of-a-kind partnership with Hartford Habitat to build an affordable home is a district-wide initiative combining education, social awareness, goal setting and student-engagement focused on achieving the school system's mission to be a high-performing district. By creating "a positive climate, an expectation of competitive academic achievement and a culture of meaningful parent and community engagement" Bloomfield school programs are specifically geared toward enabling student success. A critical piece in making this partnership a true community endeavor is that the Town of Bloomfield, in support of the school plan, donated the property at 89 East Morningside Street where the house will be built. The town's moderate homeownership rate and modest family income levels make the East Morningside Street neighborhood an ideal site for this project. Habitat already has built nine homes in Bloomfield—two in 2002, one in 2006 and six in 2014 with the town's full support. This initiative is an excellent example of how student service learning projects should work. Well-designed projects result in students realizing increased academic achievement. Engaging students in meaningful service to their schools and communities allows them to apply academic skills to solving real-world issues, linking established learning objectives with genuine needs. Students lead the process, supported by adult partners, and apply critical thinking and problem-solving skills to community concerns such as poverty housing, homelessness, and neighborhood revitalization. To get a flavor of the excitement building in Bloomfield, take a few minutes to listen to this brief clip of legendary Bloomfield-based radio talk show host and huge Habitat fan Brad Davis's interview with Chef Paul Waszkelewicz, Stacey McCann (Community Relations, Bloomfield Public Schools), and Marie McNamara (Individual Engagement Manager, Hartford Area Habitat for Humanity). How will students, parents and staff volunteer? Students ages 16 and above, along with parents/staff, are invited to volunteer at the Habitat ReStore located at 500 Cottage Grove Road, Bloomfield, CT. Volunteers 16 and above (must be 18 and over to use power tools) are welcome to form teams of up to 10 people to come out to assist in building homes on site. Students will be actively engaged in raising funds through creating social media funding pages, requesting corporate and individual sponsorships, as well as creating other fundraiser events. While the advocacy, volunteering and fundraising portions of this initiative begin this month, the construction began in the spring of 2016, with completion in 2017. 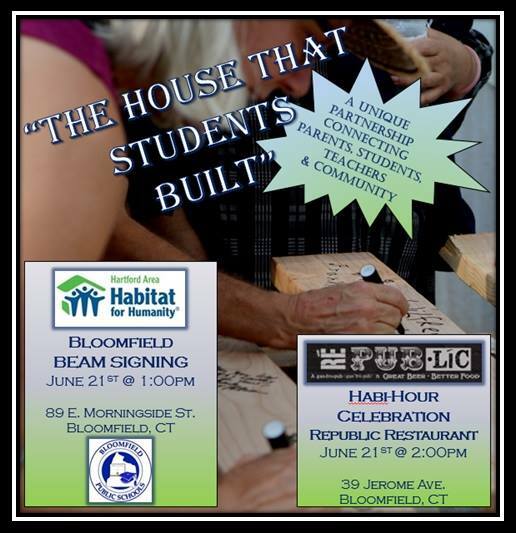 The Bloomfield community is invited to join Hartford Area Habitat for Humanity and Bloomfield Public Schools to celebrate the kick-off of construction on "The House that Students Built" with an on-site Beam Signing at 1:00 pm on Tuesday, June 21, at 89 East Morningside Street, Bloomfield. For details about the Bloomfield School System's partnership with Hartford Area Habitat for Humanity and other community engagement programs, as well as how to contribute or get involved, please contact Stacey McCann, Community Relations, at Bloomfield Public Schools, or Marie McNamara, at Hartford Area Habitat for Humanity.